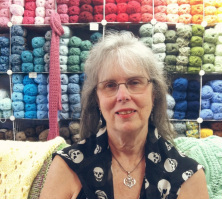 Celebrating 20 years of knitting and crochet excellence in Bellflower, CA! Monday 10:00 a.m. to 5:30 p.m.
Wednesday 10:00 a.m. to 5:30 p.m.
Thursday 12:00 p.m. to 5:30 p.m. Details: Find us on Bellflower Blvd. between Oak and Belmont. We have parking in the back of the shop and we're right beside the Bakery. Click here to visit our Ravelry group!